We met up with Charles and Fred at Manbulloo Station just west of Katherine and had a welcome bottle of champagne, called appropriately enough Grey Nomad Vintage Brut. 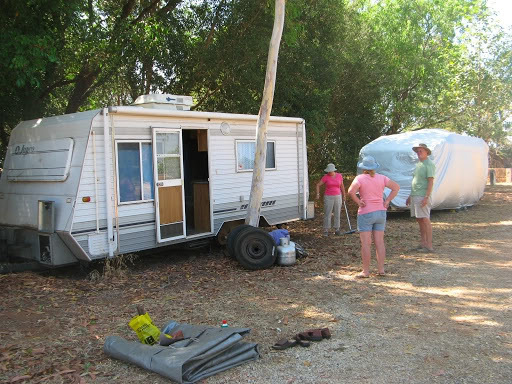 But they had just driven up from Tenant Creek, 660 km in one day, so they were justifiably tired, so we put off a full celebration, and the unveiling of their caravan, until the next day. 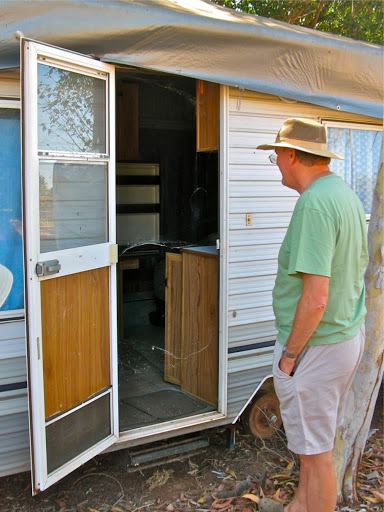 With some trepidation, we all approached Charles and Fred's caravan the next morning, which had been stored in the open for 2 years under a tarp, not quite knowing what 2 wet seasons and 2 summers might have done to it. First door opening to expose 2 years of cobwebs. The tarp looked in pretty good condition except for a few tears around the eyelets and when we opened the door there were a lot of cobwebs hanging across it. But after we had wafted away most of the cobwebs and brushed out 2 years of accumulated dust and spider droppings, the inside wasn't actually too bad. This was testament to the preparation that Charles and Fred had made before they left it. They had covered all the windows and openings thoroughly, left all the cupboard doors and drawers and fridge doors open, and vacuum-sealed all the soft furnishings with silica-gel anti-moisture chemicals. The work had just begun. While Charles and I refitted the wheels and checked out the mechanics and electrics, Fred and Janet cleaned out the caravan interior. To everyone's relief it didn't take too long before it was starting to look like it used to. There was a lot of work to do of course and it took a couple of hours with brushes and hoses to clean 2 years worth of leaves and dirt off the exterior, but within a couple of days it was liveable in and pretty much back to normal. The gas and electrical systems worked fine, we just had a small trailer plug problem with an indicator light which didn't, due to a bit of corrosion. We did a test drive in it and apart from a couple of the tyres which had gone soft, Charles pronounced that it felt as stable as ever. As a formal celebration of our meeting we booked dinner in the Katherine Country Club and they even sent a courtesy bus to pick us up. 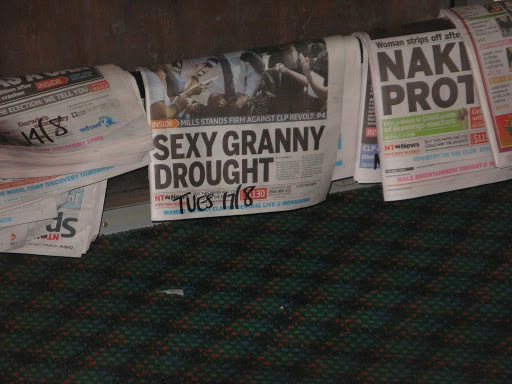 One of the more pressing problems facing the NT? 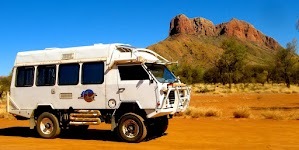 After getting their caravan back in working order and changing the Oka oil and doing some routine maintenance, the convoy set off west for Kununurra, reaching Timber Creek by dusk. 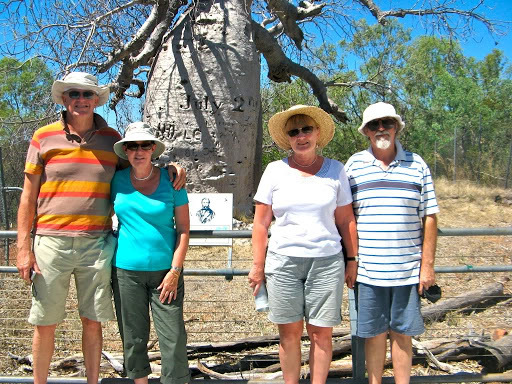 We stopped to look at the mighty Victoria River and the Gregory Tree, a large boab which Augustus Gregory blazed on 2nd July 1856 after locating the perfect landing site for his ship, 145 km up the Victoria River from the coast. He made camp there for nearly a year while he explored inland and found the perfect timber for repairing his ship near Timber Creek, which is how the location got its name. 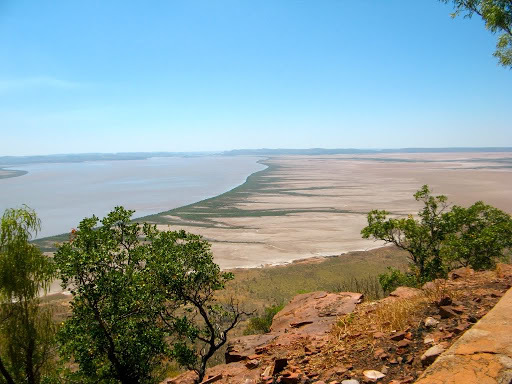 Gregory located and mapped the good cattle grazing areas and rugged ranges of the east Kimberley region. We then drove through the scenic National Park which now bears his name to the WA border. There we had to undergo strict quarantine inspections and surrender all our fresh fruit and vegetables including my delicious honey. We knew we would have to of course, and we had used or cooked as much as possible, but not even I could eat 20 honey sandwiches before reaching the checkpoint. 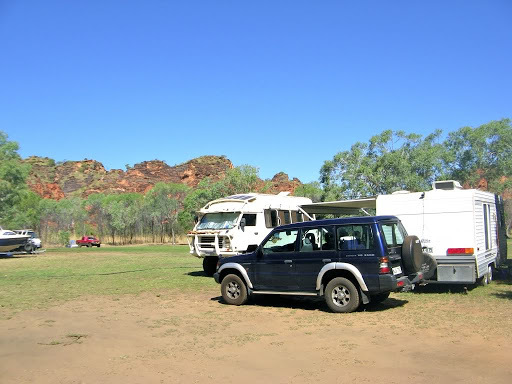 We arrived in Kununurra later that day and rested in the Hidden Valley Caravan Park. 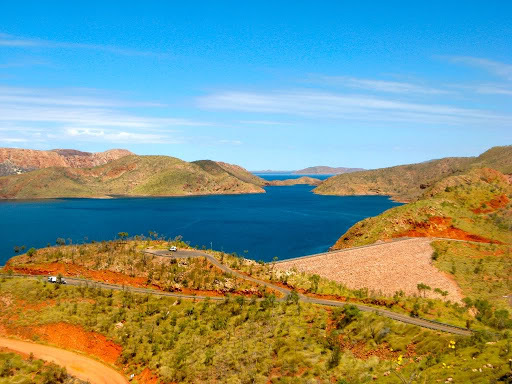 Over the next few days, apart from shopping, we visited Lake Argyle, a massive artificial body of water, 21 times the size of Sydney Harbour, fed fish (who spat at us) at the Zebra Rock Galley and drove up to Wyndham, just because it's there at the end of the road. 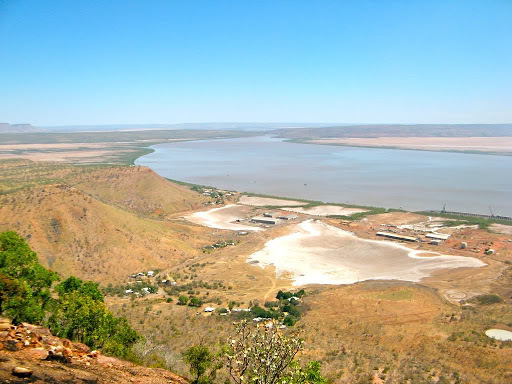 There is a spectacular lookout there, the Five Rivers Lookout from which you can get a 360 panoramic view of the Wyndham area. The town at ground level is not so spectacular however but it does have an interesting historical museum. Lake argyle and its surprisingly small dam. Lake Argyle is surprisingly huge but the dam wall is quite small considering the colossal volume of water it is holding back. Next day, while Charles and Fred were away buying a new kettle, after I failed miserably to mend their broken one (in my defence, the element had gone and it also formed part of the base so it wasn't replaceable anyway), we went to the Kununurra Market. We watched a lady making lace, which she said she could quite easily do while watching telly. It looked awfully difficult and fiddly to us, manipulating more than 50 small bobbins in a complex predetermined pattern. A bit like French Knitting raised to the power of 10, but the end result looked superb. 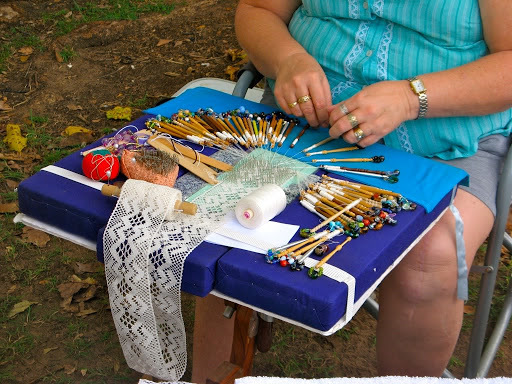 Lace making at Kununurra Market. We had frozen mango slushes to cool off and janet also bought a frog, as you do. 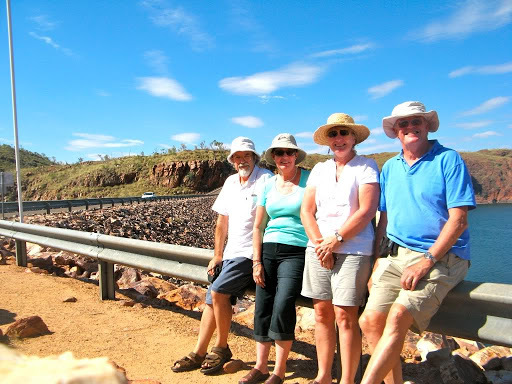 Charles and Fred also took a float plane flight over the Bungle Bungles and the Argyle diamond mine, since these places are difficult to get to on the ground, and landed near an isolated island on Lake Argyle for morning coffee. In the afternoon we visited the Zebra Rock Gallery. The exhibits were beautifully crafted but very expensive, so we opted for looking at the birds and feeding the fish in the Ord River which flows across the bottom of their garden. The birds were mostly iridescent Rainbow Bee Eaters which swoop out of trees, catch insects in flight and then return to their perches to await their next victim. The fish were mostly large catfish that wriggled and squirmed though the reeds after any morsel of bread thrown towards them. Later we had dinner at the Pump House Restaurant, described quite correctly in the brochure as "Industrial Chic". It was an old water pumping station, obviously, left redundant after the Ord River scheme was completed in the 1980's. It's been converted to a restaurant with tables scattered amongst mechanical pumping equipment and electrical switchgear. Outside there was live music on a platform overhanging Lake Kununurra and fish swam around the piers supporting the building. I never knew fish could support a building so there ya go! Sunday night was oven cooked pizza night and they were pretty good. 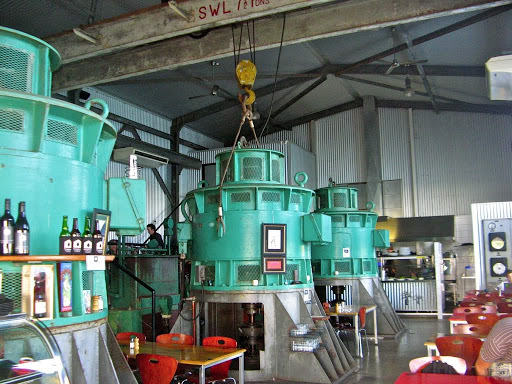 The Pump House Restaurant with tables scattered amongst the machinery. The steering box on the Oka was still leaking oil and it wasn't getting any worse but it was enough to be worrying, about 300 ml per day, so we had to change our plans somewhat. 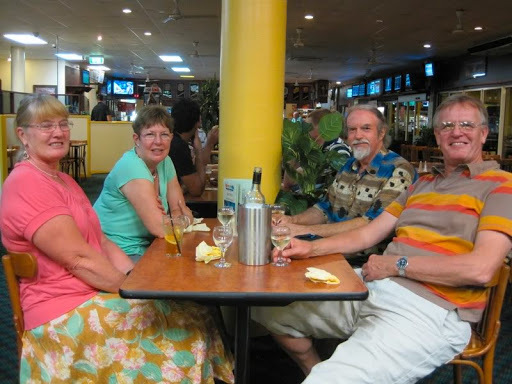 We had intended to go further with Charles and Fred to Halls Creek and maybe head down to Wolf Creek Meteorite Crater with them, before heading back to Alice across the Tanami Track. However prudence suggested that we should return to Katherine and then home down the Stuart Highway just in case something catastrophic happened and we needed assistance. 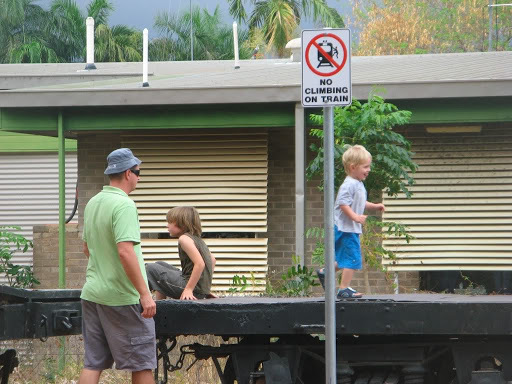 But then we heard that the Tanami Track had been closed due to rain so we had no option anyway. 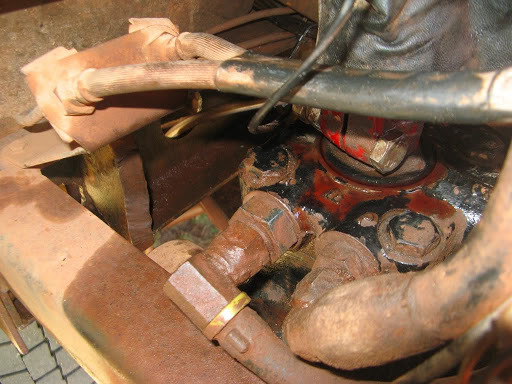 Red fluid oozing from a leaking seal on the power steering box. After a sad farewell to Charles and Fred in Kununurra (although we will see them again in Adelaide before they return to the UK), we set out back towards Katherine. On this leg, we came across a caravanner with a shredded tyre. He was adamant that he didn't need any help but it was very hot and he was struggling so we helped him anyway. I jacked up the caravan and put the spare tyre on and he was mighty relieved. We had a lot of difficulty removing the shredded one as the cords and bits of rubber had wrapped themselves around the axle and brake drum. He said the tyre was only 5000 km old but new tyres don't just shred themselves. It had been running too soft, due to a puncture or neglect, and at high speed. He had overtaken us twice, and at the road works traffic lights he was itching to get going, riding the clutch and inching forwards, and he was off like a rocket as soon as the lights changed. I said to Janet "there goes a problem to happen soon" and it did. He offered to buy me a beer when next we met but I'd settle for more brownie points in the bank. We spent a couple days in Katherine preparing for the trip south, buying supplies, except for grog which was getting ridiculous in terms of quantity and price. 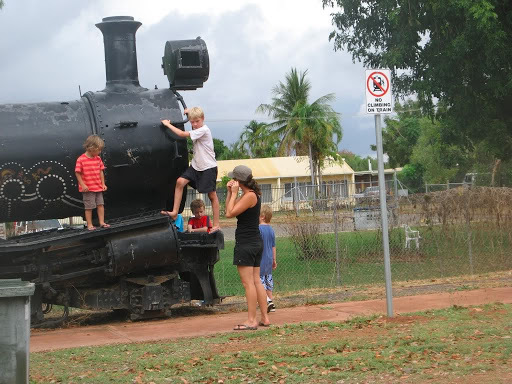 In the week we had been away in Kununurra, most of the tourists had left, leaving the town to the indigenous population, and the heat and humidity had risen significantly. An early build up to the Wet, they said. So we weren't too sorry to be heading south, but before we left there was a Saturday morning market, when it rained, which only added to the humidity. But Janet still bought some more earrings, as usual. The market is next to the old railway station and there are some old wagons parked nearby with signs clearly marked "No Climbing On Train". Plainly some people don't think it applies to them as they lifted their kids on and off.